The images below are of various box dioramas and “mini-boxes” seen at recent shows (and generally snapped on the fly with the cell phone, unless otherwise credited, so apologies for the quality!). Please, if any of these pieces are yours, or you know the modeler, contact us and send us some more information and images so we can create a proper gallery page for you! Two shots of a very nice partial box diorama featuring a Japanese mini-submarine by Asian modeler Francis Lee found on Facebook. A wonderful and whimsical little fantasy box by Massimiliano Amon Richiero found of Facebook. Irish modeler Mike Lynch submitted the shots above via email; they depict a 20 x 20 inch model of a railroad roundhouse. 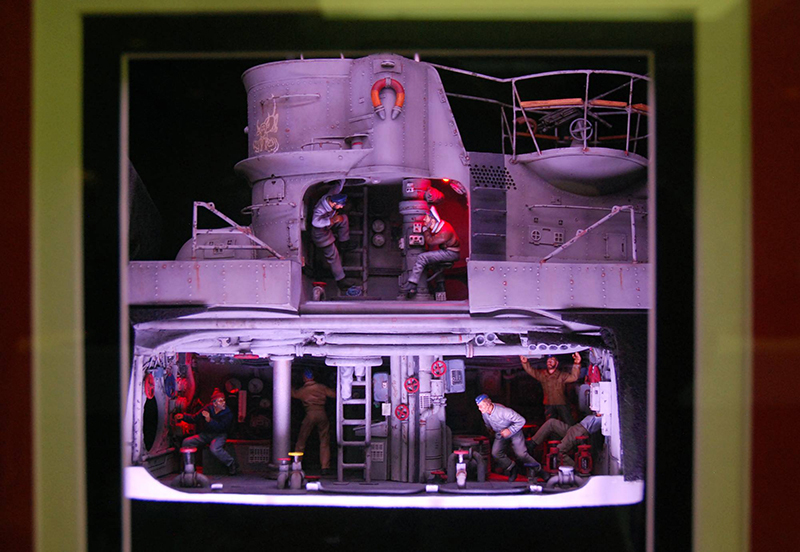 Mike writes: "I was always very much taken with the way Shep Paine used artificial light in his dioramas and so have tried to emulate his techniques in most of my layouts. Modelling can bring much joy and it can be great medicine when wanting to block out the troubles of the real world. I try very much to promote this and am always looking at ways to encourage people into the hobby." More of his work can be seen at www.paternosterrow.blogspot.com. Above is an excellent single-figure box recently completed by Greek modeler Vasilis Triantafyllou. The link will take you to his Facebook page, and we would love to feature more of your work, Vasilis! 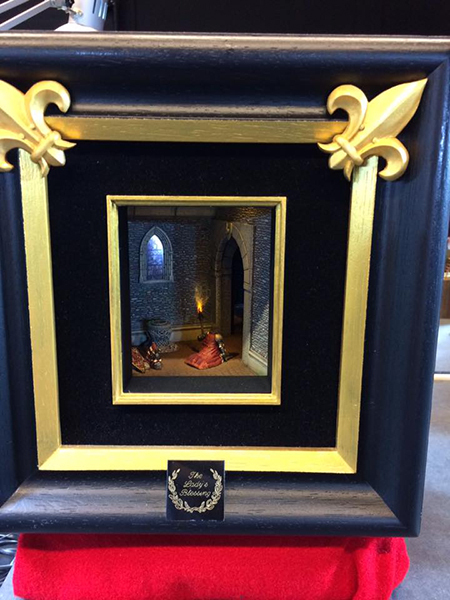 Above are two shots of a Medieval-themed box shown by Adrian Smith at the Eindhoven show in 2016. 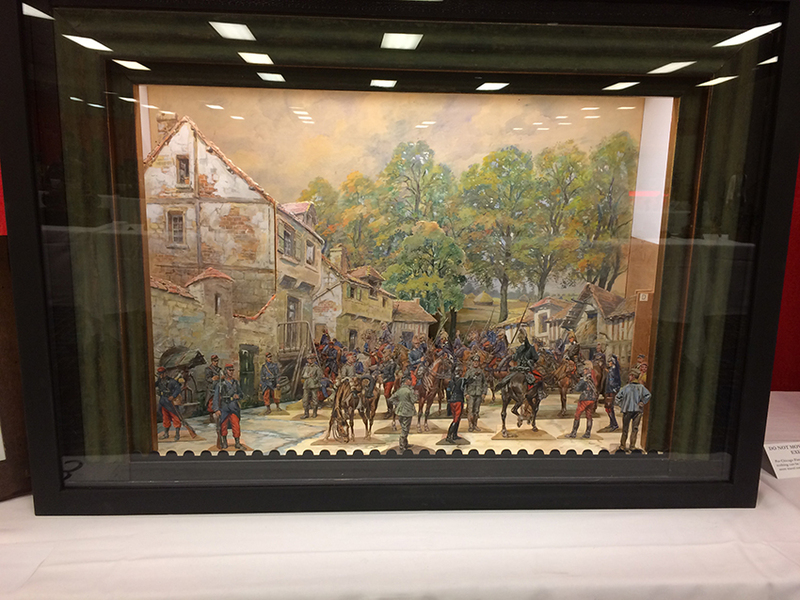 Here are two ambitious dioramas show in 2016 by Mike McFadden, a member of the U.S. Junior Scale Modeling Team. Well-done, Mike, and keep at it! Photos by Penny Meyer. A nice still-life box found recently on the web, artist unknown. Great work; contact us! We would love to credit you, tell the story, and see more. A striking Historex scene found on the Web with the following description: Vincennes, 21 March 1804, three in the morning. Very odd things are happening in the ditches of the castle... Kidnapped in Germany where he had migrated, summarily tried by a military tribunal, Louis Antoine De Bourbon, Duc D’ Enghien, accompanied by his dog Mohiloff (a pug). Listen to his death sentence was read by an Adjutant-General by the light of a lantern. The Army Platoon, elite guard consular is ready, the grave too... On the bridge crossing the divide, the generals savary (Panache to the cocked hat) and hulin (scarf of command on the frock coat) were present at the scene with the other officers forming the military tribunal having signed what Talleyrand will say that it was more than a Crime: a fault! Contact us for credit! A Star Wars box seen on the Web. Nice stuff; contact us for credit and to tell us the story!